Well I finally jumped on the cake and fondant bandwagon and gave it a try! I was given a recipe for Marshmallow Fondant from a friend and fellow baker, so I figured I might as well. 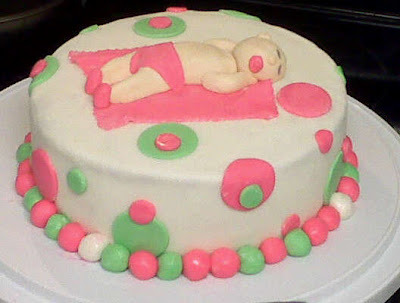 I made a homemade pound cake with homemade buttercream and chose to make this first cake with a baby shower theme. My love of pink and green came out along with my favorite, the polka dot! It took a few trials of rolling out the fondant, but it worked like a charm and was easier than I thought it would be. I was pretty impressed with myself! I learned not to roll it too thin and that a little gel coloring goes a long way, but the bright colors worked well. Thank goodness my co-workers love to eat my goodies because I was able to come home with a clean cake plate!